Nacha Mendez is regarded as the state’s reigning diva of Latin music, having won this year’s New Mexico Music Award in that category. 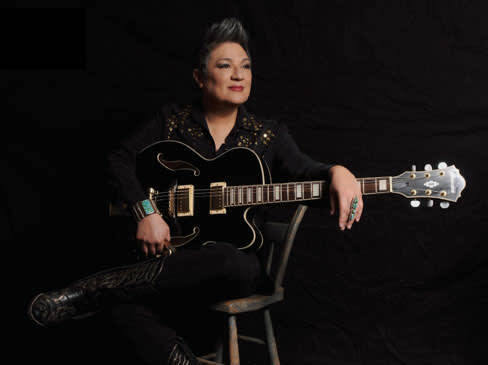 She’s known for her ability to blend styles and shift from one to another on a dime: On any given night in Santa Fe, her audience may hear tango, bolero, ranchera, cumbia, salsa, bossa nova, and cha-cha—or two or more of these styles at once. Born Marghreta Cordero, in Chicago, and raised in the small border town of La Unión, Mendez has been performing throughout the state on and off since 1978. She was a member of the first all-girl punk band in New Mexico, the Quadrasexuals, formed in 1980. She then caught the New Wave bug, and was a part of the seminal bands Madonna Moderna and Venus Envy. After moving to New York for a short while, she returned to New Mexico in the early 1990s, and began performing again. After meeting composer Robert Ashley and touring with the company for his avant-garde opera Now Eleanor’s Idea, Mendez took a couple of different jobs in Santa Fe: one at a local radio station as production director and on-air host, and another as a receptionist and mail clerk at the Santa Fe Institute, a multidisciplinary research facility. In 1997, Mendez left the institute to concentrate on songwriting, and quickly rediscovered her Latin roots. She started a group in 1998 called Sangria—comprising six female guitarists. By her own description, the band was a female version of the Gipsy Kings. After releasing her debut album in 1999 while living in New Mexico, Mendez left for Sebastopol, California, where she spent four months writing new songs. On her return to the Land of Enchantment, she picked up a couple of weekly engagements—one at the Adobe Bar, in the historic Taos Inn, and one at El Mesón restaurant, in Santa Fe—that lasted for close to seven years. She has performed primarily in Santa Fe ever since (see “Need to Know,”). Eric Davis met with Mendez in her Santa Fe home, as she cooked dinner and talked about her musical journey. You learned traditional Mexican music from your grandmother, and took her name as your stage name. Tell me about her. My maternal grandmother was a singer and guitarist, but she didn’t make it a career. She just did it as a child, busking in the mercados in La Fe, Coahuila, Mexico, with her father and brothers. Years later, when mom was working in a factory in El Paso and dad was working as a carpenter, Grandma Nacha was sent from Norwalk, California, to take care of my brother and me in La Unión during the summer. And I learned music from her. So when it came time to go to college, you studied classical voice and electronic music at New Mexico State University. When I was in school, I was in choir, I was in sextets, I sang with the chorale groups . . . I remember telling my high school counselor that I wanted to go to Berklee College of Music [in Boston] And she said, “Well, I wouldn’t encourage it because your grades are not that great. Why don’t you go to a state school and make it easy on your parents?” I ended up at New Mexico State. There was an electronic-music department, and that seemed interesting, so I signed up. But I really spent most of my college years studying journalism and radio broadcasting. That’s what I made a career out of in Santa Fe and New York for 25 years, as an on-air host, production director, all of that. I liked it, but I really loved making music, too. How did you end up in Santa Fe? After college, I came straight here. My brother came here first, and he wrote me a letter saying, “You should really come, you’ll like it.” And I did. I got a waitress job, I ended up staying, and the rest is history. This was around 1978. I got jobs in radio right away. I was performing, too. Mostly in restaurants, for tips. And then, in 1985, I moved to New York. Why? I thought I could make a go out of it with my music. And I had friends in New York who said, “You should come. We will help you.” I did some performing, I made a record, I was there for five years, and I just felt like it was going to take me a while to really get known. New York is very stimulating. All of your senses are just activated . . . everything becomes alive in your body and in your mind. Everything. And I think I was overstimulated. And at some point I decided to come back home. I first went to Taos, and then Chimayó in 1990. And in Chimayó I felt like I could really focus on my music. I started doing Spanish folk songs. Just my guitar and me. Then I ran into an old friend of mine from New York who had moved here. He suggested that we do some music together. So we started collaborating. One day he told me that he knew this guy who was a famous composer in New York, Robert Ashley, who was looking for a Latina to work with in New Mexico, because he was writing a “lowrider opera” [Now Eleanor’s Idea]. My friend thought I’d be perfect. Then Ashley asked me to tour with the opera, when one of the performers dropped out. But the singer was a male, and I ended up playing all the male roles! I toured the world with the production—Japan, France, Germany, Austria—and it was the best time of my life. It was really the turning point in deciding to become a full-time musician, and that’s been my main focus ever since. How do you see the evolution of Latin music in New Mexico, based on the people you see and know? Where does it go from here? I think there’s a really strong, deep-rooted scene here. When I listen to music on KANW 89.1 FM [Albuquerque public radio], that, to me, is New Mexico music. The radio station has been playing Spanish music performed by New Mexico artists since the early 1970s. People that I feel have influenced the scene here recently include Nosotros, the Manzanares brothers, and Felix y Los Gatos. Honestly, I think that everyone, including myself, is still on a journey of discovery to try to get a New Mexico sound. You’ve released three CDs. Are you planning to release a new one soon? I am. The working title is Piensa en el Amor (Think of Love). I haven’t put one out since 2004, and this one has been three years in the making. I’ve recorded it in Santa Fe, partially in my home, and partially in the studio at the Santa Fe University of Art and Design. I’ve been working on it with Stephen Duros [formerly with Ottmar Liebert], who is not only a great musician, he’s a great recording engineer. Other musicians on the CD include violinists Carla Kountoupes and Luis Mascaro, Chase Morrison on cello, and pianists Andy Kingston and Melanie Monsour. Plus, one of the tracks is a collaboration with African kora master Foday Musa Suso. This CD shows off bits and pieces of all that I do musically. I’m thinking a December release, in time for Christmas. Eric Davis is a Santa Fe–based writer and the promotion director for Hutton Broadcasting. Nacha Mendez performs weekly in Santa Fe at three venues. Find out more at nachamendez.bandcamp.com and on Facebook.